Landlords, Should You Allow Pets in Your Rental Property? As a landlord, you've probably given some thought as to whether or not you should allow pets in your rental property. And if you’re catering to military renters, it’s especially important to consider. A large number of military families move with pets, and will immediately pass by your property listing if you have a “no pets” policy. Allowing pets opens you up to a broader pool of tenants. You can justify charging a higher rent for a pet-friendly property. Military landlords often have mixed feelings about pets. Some require hefty deposits, while others allow no pets at all. Many landlords admit their properties rent much more quickly when allowing pets. Some say they’re going to bring them anyway, so why fight it? In their view, it’s better to require a pet deposit upfront to offset any possible damages and have guidelines in place. Here are some facts. A recent Apartments.com survey reports that 72% of renters own pets. 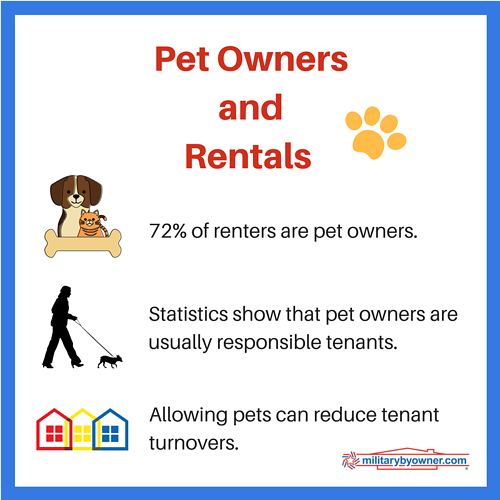 Statistics show that, overall, pet owners make good tenants. Pet owners are more likely to renew a lease. 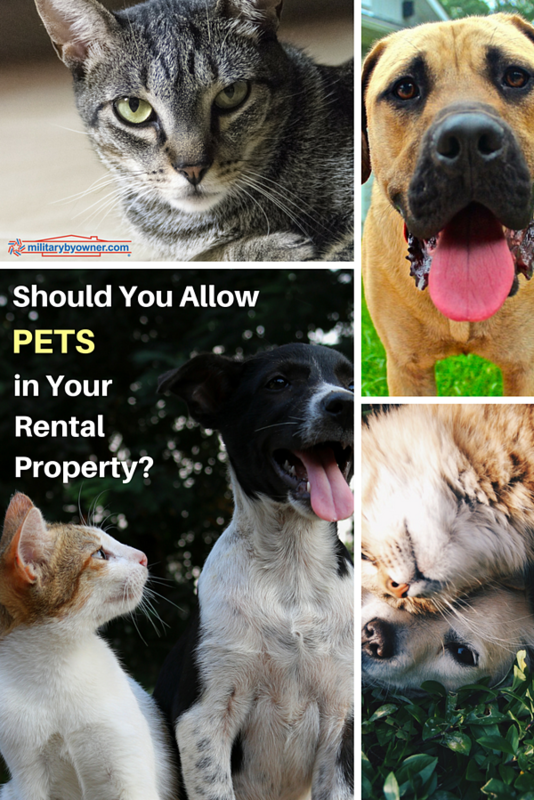 Of course, only you can decide if it’s worth allowing pets in your rental property. If you don't want pets in your rental home, be sure to state this clearly in your lease. But if you do rent to pet owners, it’s important to take a few steps to protect your property and understand your legal obligations. If You Allow Pets in Your Rental, Start Here! Whether it’s a pet deposit, non-refundable pet fees, or a monthly “pet rent,” charge a reasonable fee to repair any damages or pay for carpet or other cleaning on move out. Not sure how much to charge? Take a look at your local rental market to see what the going rate or deposit is for pet-friendly rentals. You may wish to approve dogs based on weight rather than breed. For instance, some leases allow dogs only under twenty pounds. Add wording for approval on a case-by-case basis if that’s what you plan to do. Whether or not you require proof of spaying/neutering. Require renters insurance. This will cover your tenants and you in the event of accident or bite. Stipulate that pet waste will be removed regularly and where it’s to be placed (i.e. outside trash bins only). Require proof of current vaccinations and that cats and dogs are microchipped and wear tags. Behavior: that pets will be kept under control at all times or leashed when outside. No tethering of animals or left outside in a fenced yard in extreme temps or at night. Tenants are responsible for any damages caused by pets. Whether or not exotic pets are allowed. MilitaryByOwner’s partner, US Legal Forms, has pet specific addendums for rental properties. How many pets should I allow? What kind? The number of pets you allow should make sense for the property size. You might choose to limit exotic animals or certain breeds, as well as require your tenant to seek approval for pets. Also, if you plan to return to the home some day, you may have tighter guidelines if you have a pet allergy. Some insurance companies won’t issue renters insurance for certain dog breeds, such as pit bulls, so check with your insurance provider before deciding which pets to allow. What about small pets or fish tanks? You may decide on a policy of cats and dogs only, and no exotics (lizards, chinchillas, rabbits, etc.) Even small animals can cause damage if let out to roam and large fish tanks can cause carpet damage or flooding issues. 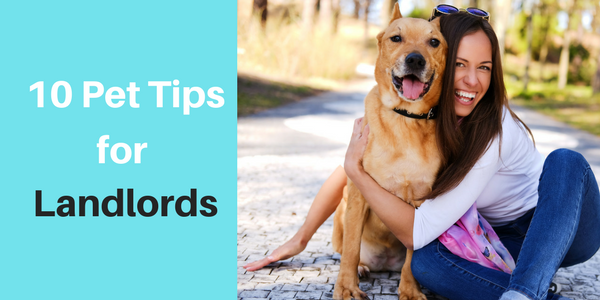 Add wording to your lease along the lines of “tenant’s pets only” if you don’t want a tenant caring for extra pets on your property. Also include specifics about visitors’ animals, including if it's allowed, length of stay, and so on. Under law, landlords must provide "reasonable accommodation" for service or support animals. For more information, Rentalutions has an in-depth article on the topic of service animals and rental properties. Be sure you are complying with the Fair Housing Act as well as local and state laws. Check with the ADA site for the latest laws regarding service and emotional support animals. Check your HOA for regulations. Your homeowners association probably has rules in place regarding breed, types, and number of pets. If you’re renting out a condo, there will certainly be regulations regarding pets, including noise that would disturb neighbors. Many families consider their furry friends members of the family. By opening up your rental to pet owners, you not only provide support to military families but you broaden your potential pool of renters as well. See the infographic below for even more tips. Landlords, share with us your best tips regarding tenants with pets!